For 3 years I was part of the group that ran the Brighton Zinefest. We started just with the idea it would be fun to have a zine event in Brighton and managed to build a successful and fun event. Sadly we don’t run it any more because some of the original organisers live in Brighton any more, the others were too busy, and nobody new appeared to take over, and so it just wasn’t practical to hold another. You are not going to make any money from holding a zine event. Only run a small-scale event by yourself. If you want to hold a bigger event, it’s best to be part of a group. Otherwise you are likely to die of stress. If you have a group, you need to decide from the outset how it will be run. For the Brighton Zinefest we operated as a collective (with 5-7 per year), where each member had equal say (ie there was no leader) and decisions were made by consensus. We recognised that people had lives outside of the event, and kept minutes of our meetings and emailed them to people if they couldn’t make it that month, and the members increased and decreased their involvement week to week to fit in around their lives. Things ran very well because we respected each other and worked co-operatively. Bringing office politics and power struggles into organising an event that’s supposed to be fun is pointless. Don’t over-commit yourself. It’s unrealistic to think that you will live, eat and breathe organising this event, and unrealistic to expect anyone else to. You also have a life, don’t forget about that. On the other hand, don’t expect to be able to skip out on all the tedious organising stuff before the event and expect it to run smoothly. Use people’s strengths and work round their weaknesses. For instance if you’re someone who tends to panic, get someone with a cooler head to deal with things that go wrong last minute and so on. Make use of people’s contacts and real-life jobs and so on as well. For instance, one of our organisers was very involved with music and putting on bands, so he was able to organise a fund-raising gig much more easily than any of the other members of the group. Make a spreadsheet to keep track of finances from the outset and be diligent about it. Don’t sink much of your own money into an event, especially if it’s your first. You’re better off holding something small in a cheap/free venue to start out with. Be prompt and organised about answering emails, and if you work in a group make sure people share their information so everyone knows what’s happening and who’s dealing with what. Don’t underestimate how much time it takes to organise things. Trying to organise a huge event in a month is just going to be painful. If you don’t have much time to spare, keep it small. The first step is finding a venue and choose a date and time to book it. It’s unlikely you have much of a budget, especially if it’s your first event. There’s not much money in selling zines, so the stallholders won’t be willing to spend much for stall fees, and visitors don’t really want to pay much of an entrance fee, so you need to find somewhere cheap. Holding a fund-raiser before hand is often better than trying to get stall-holders to pay more for stalls. Community halls, schools, universities and libraries often have suitable rooms available for low prices, and are quite likely to give you a heavy discount or even let you use it for free for a non-profit thing like a zine fair, especially if there are going to be free workshops. They also have tables and chairs already there, which is very important. Weekends tend to be best, because people are more likely to be free to visit then. In the UK afternoon fairs 12-5 seem to work the best, but you should choose what works the best in your country/culture. It’s also important to consider accessibility. It’s very likely that people with wheelchairs, walking sticks, buggies and other things that don’t go very well with lots of stairs will want to come. This is another reason why places like community centres, schools, etc are a good venue to choose, because they tend to be required by law in most countries to be equipped with step free entrances, lifts, disabled toilets and so on. Places like universities also often have things like induction loops for hearing aids. Find out what the venue’s policies/facilities are regarding food. They might have a café in the building and not allow separate sales of cake, refreshments etc, they might not allow home-cooked food that’s not from a certified kitchen or they might have a kitchen you can use for whatever you want as long as it’s left clean (this is the most common thing in the UK). In the UK (I don’t know about other countries) it’s very popular for people to bring cakes to either sell from their stall or to donate to the event as a fund-raiser, and it’s important to know if the venue allows this. The ideal venue is accessible without stairs (so either is on the ground floor, or has ramps or lifts), has a generously sized main room for stalls, plenty of tables and chairs, another smaller room for workshops, facilities to make drinks, decent toilet facilities, a quieter area over to one side to let people relax and chat (a craft table or library box of zines to browse is also nice in this area), is easy to get to and has parking. A lot of people appreciate unisex/non-gendered toilets too. Of course it’s not so easy to always find such a perfect place. In our first year we used a local hall that we were offered for free. It was accessible, had a kitchen, a stage, tables, a car park, clean unisex toilets, and was in the town centre. The downside was that there was no separate room for workshops (we ended up having them at a local café/social club place), the hall was quite small, so it got very crowded, and to get to the kitchen you had to walk over the stage. The second and third years we moved to a similar but larger hall, which offered us a very cheap rate. It had a kitchen with a serving counter onto the main room and separate rooms for workshops, but we didn’t get to use all of the available space, because some of the extra rooms were up steep stairs, and it didn’t seem fair to put too much up there (it’s a very old building run on a low budget, and I think they’re trying to get money for a stair lift). In the end we ended up putting six or so stalls up there, because there was literally no-where else to put them on the ground floor, and were prepared to ferry a tray of things down for anyone who couldn’t get up there but wanted to browse, but we preferred to keep as much as possible downstairs. The other disadvantage was that it was in more of a residential area, and on a steep hill, which makes it less likely to get curious passers-by pop in. If you can, try to have a sitting down area with some kind of craft activity. It can be something as simple as some old magazines and pictures for making collages and some paper and colouring things on a small table in a corner. Anxious people and those with children will thank you for this. A popular thing to do is provide pre-cut sheets of paper for people to make a page for a collective zine, and a box to leave them in with a sign up sheet for contact details if you’d like to see the finished zine from the day. Before you go advertising or allocating any stalls you need to go to the venue and have a physical “dress rehearsal” with the tables and chairs. The inventories/floor plans venues will give you are often out of date or inaccurate. It’s best to have 2 sizes of stall, small and large. Usually these are done as full or half tables on the typical large painting tables that most venues have. I’ve been to events before where they try to cram in 1/3 tables and it just gets cramped and messy. In my opinion you’re better off having fewer stalls fitted in better. It’s very important to know how many tables you actually have and how they fit into the room. I once went to a zine event and there weren’t actually enough tables or chairs for all the people they’d given stalls to. I was running late due to a transport problem, and I got there all flustered and hot only to find I didn’t even have a stall any more, and would have to stand at the bar instead and decided to not bother with the fair. Luckily I hadn’t travelled very far to get there. Large stalls are for people with lots of stock: distros and people with lots of back issues. It annoys the stallholders to get to an event and find that they have been given half a table for 15 different issues of a zine or a whole distro, and there’s someone with a full table for 2 different issues. Lay out the tables with plenty of room for people to walk and a wheelchair to pass between, at least 6ft5 / 2m if possible, and try to avoid creating areas where people can get cornered once the event gets busy. Having a gap between tables for stallholders to get out is also helpful. Make sure to put out enough chairs: bare minimum is one chair per small stall and two per large stall. Also make sure that space allocation is fair, measure all the tables and give a set amount of space for large and small stalls. It’s not fair to just go “half tables!” when all the tables are different sizes. Mark out your stall boundaries with masking tape and make a careful floor plan. This might seem excessive or pernickety, but it comes in very useful on the actual day, and means you don’t accidentally over-allocate stalls, and you know where everything is meant to go. You should also allocate a large table for people to bring individual zines to sell, and a table for freebies. For allocating stalls I think it’s best to set a deadline for applications rather than doing first come, first served, because it stops people with great zines missing out on a stall because they didn’t hear about the event. When you ask for applications you need to have clear policies on what people can have on their stalls spelled out in the info. For instance we said crafts are welcome, but stalls must be 75% zine, and we don’t accept zines with bigoted material (racist, sexist, homophobic, etc, etc). In the application ask people what size stall they want, if they are a distro or individuals, and to describe what their zine(s) is/are about and provide a link to their website or Etsy. If you are clear about these things on the outset you’re far less likely to suddenly find on the day that you’ve given a stall to someone who runs a Klu Klux Klan zine or something. 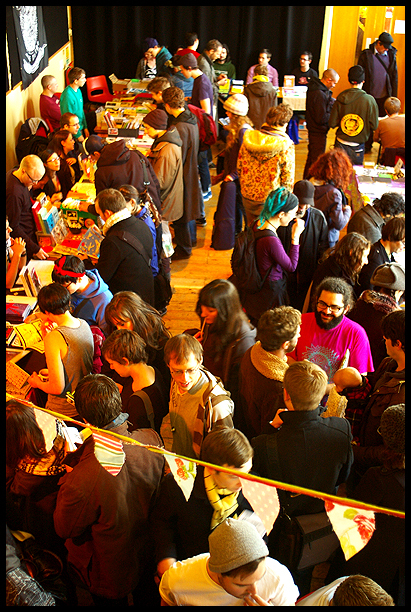 If you don’t specify tables must be majority zine, sometimes it can turn into more of a craft fair with the odd zine. We also came up with a suggested price guide after visiting an event where people were trying to sell standard photocopied b/w zines for ludicrously inflated prices. If someone writes in and says “I don’t have any zines yet, but I plan to have made one by the event”, don’t give them a table. Who knows if they will actually follow through. If they finish it in time, they can always put their zine on the individual zine table. When you have chosen what people to give stalls to, remember to send a polite email to the people you turned down. Don’t leave notifying people too late. Often people travel long distances to get to zine events, and if you leave it too long they might not be able to come, because they often rely on cheap advance tickets for travel. Give the stallholders plenty of info weeks in advance: travel directions, the time they should arrive, and a phone number to call on the day if they have problems getting to the venue or finding it. Make sure the phone number you give will actually be answered. Workshops at zine events are always really popular, and quite easy to organise at very low cost. You can usually get volunteers to give them. Popular things include zine readings, talks, discussion panels and demonstrations of DIY skills (we had over the years: screen-printing, basics of zine layout, vegan cooking, basics of comics and bookbinding). Make sure to have a set timetable for workshops, display it on your website/blog, and have it printed large and displayed very prominently at your zine event so people know what’s happening, when, and where. Having your workshops in the same room as stalls is a bad idea because it’s very easy for people’s voices to get drowned out by the bustle of the stalls. Having volunteers to help with the running on the day will also make it less stressful for you. Volunteers can help set up the tables right at the start, and put them away afterwards. It’s good to have someone to mind the individual zines table and a donation bucket if you have one, and to do tea and coffee if you have the facilities. I think the most important thing to do here is not start too late. It’s a good idea to set up a website/blog as soon as you have a venue confirmed. On the website/blog at least have a summary of what will happen at the event, contact details for the organisers, how to apply for a stall and travel directions to the venue. You can also appeal for volunteers to help out on the day.Get an artistic/designy friend to do you an attractive flyer with the date, time, website/blog, location and full address of the venue. If your flyer looks boring or scrappy and doesn’t have the full info it’s not going to help you get people to come. Print lots of quarter-sized flyers cheaply. Black and white photocopies are absolutely fine, you don’t need to bankrupt yourself with glossy colour printing. Using coloured paper can make them look nice on the cheap. Send flyers to distros months before the event for them to send out with zine orders, and hand out flyers and chat to people at other zine events and other things where you think people might be interested in zines (gigs, craft/diy events etc). If you’re shy, maybe get an outgoing friend to help you with this. The personal touch of talking to someone or receiving a flyer with some zines makes far more of an impact than an email or Facebook mailing list. Having a coloured-in digital version of the flyer available on your website/blog for people to post on their own blogs also helps you spread the word. Make sure to contact your local listings magazine well in advance, they usually require you to send details a month before each issue comes out. Local newspapers are also quite often keen to cover these types of events too, especially if you don’t live in a big city, so try to contact them. A few weeks before the event, go round local shops to leave flyers. Places like independent coffee shops, clothes shops and record shops are usually enthusiastic. Chain places usually won’t let you. Be polite when you ask. If you have left flyers, return once a week to check up on the levels and replace them if possible. Don’t rely on Facebook events to help you promote. A lot of people get so heavily spammed with events that don’t interest them and are happening 3,000 miles away that they barely pay attention to their Facebook invites. There’s plenty of people who don’t use Facebook or have an account but don’t really bother with it too. Get to the venue several hours in advance to set everything up. If you aren’t going to get in trouble for it, it’s a good idea to fix up paper signs with arrows pointing the way from places like the local bus or train station. Make sure to have a clear sign outside the venue, this will also attract passers-by. Fix a sign on the door visitors should come in by too. If your venue has multiple rooms, fix up signs inside pointing to the other rooms so people don’t miss them. If there are other things going on in the same building make sure to have signs showing where your event ends. Simple computer printed sheets of paper are fine for all this. If you have workshops, have large printed timetables of them pinned up everywhere. If your country/region uses multiple languages, try to have signs in all the languages, checked by a competent/native speaker if possible. You want the whole place to be easy to find and to look welcoming. The stall-holders are usually told to arrive an hour before doors open to the public. All the tables and chairs should be set up before the stall-holders arrive, and I strongly suggest marking out the stall boundaries with tape and putting the stall-holder’s name on the space. People tend to spread their stuff out to fill space, and if there’s no boundaries marked it’s easy to go over your space and not realise until your neighbour arrives and you have to move all your stuff again, which makes set-up take much longer. Having the stalls marked out and named also has the advantage that people can swap stalls to be near a friend without messing up the layout much, because all they have to do is swap the name labels on two same-sized stalls. Stall-holders always arrive late or get lost, so don’t freak out about it, they will get there eventually, and everything will work out fine. This is why giving them your phone number well in advance is a good idea. Having the stalls marked out and named means that if someone does arrive really late they can just be calmly directed to their space, and it hasn’t been taken over by someone else, causing a big reshuffle. Have someone at the door with a list of stall-holders, checking them off as you arrive. Once the public start arriving, it’s also a good idea to get someone with a microphone/loud voice to announce upcoming workshops. Hopefully everything should be fun throughout the day, and if things do go wrong, don’t worry too much, it’s unlikely anyone will die because the zine reading started 20 minutes late. Make sure the person running the individual zine table keeps careful track of how many issues people left, how many sold, and the money made so there are no arguments at the end of the day when people come back to claim their unsold issues and money. When everyone has gone, put the tables away and clean up, and you’re done.